For today's Feel Good Friday we're heading to Massachusetts to see how a former president of Trader Joe's is using his experience to run a non-profit grocery store in Boston. 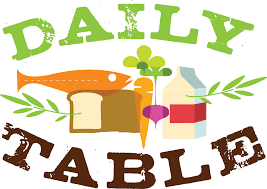 Daily Table has been providing healthy, affordable food in the Dorchester neighborhood since June, 2015. What's the big deal? Some statistics from their website explain the need: 48.8 million Americans live in food insecure households, 34% of American adults over the age of 20 are obese and 80 billion pounds of food is wasted in the US each year. That's the big deal. Doug Rauch founded Daily Table to address these issues. As they explain on their website, "At Daily Table we believe that delicious, wholesome and affordable food should be available to all. We are on a mission to help communities make great choices around food by making it easy for them to choose tasty, healthy, convenient and truly affordable meals and groceries. And we do this in a respectful manner that honors our customer, engendering dignity." Daily Table is able to meet this mission by partnering with like minded community organizations, a variety of funders and over 50 local food suppliers. They procure and sell "wholesome, nutritious food that is excess or overstocked from grocery stores, food suppliers, manufacturers, restaurants and growers". This is all done in a retail setting that looks (to me) a lot like Trader Joe's. In addition to food sales, Daily Table offers free cooking classes, online recipes and guidelines on how you can buy enough food for three meals a day for an average of $45/week! You can learn more about the organization by reading this article from the Christian Science Monitor or checking their FAQ page. Depending on where you live and what you do, you can get involved by supplying food or volunteering. And no matter where you are, you can show your support for Daily Table by making a donation and liking their Facebook page. Yum!